Dive into an Arctic adventure tour with our 2 Day King Crab Fishing package. 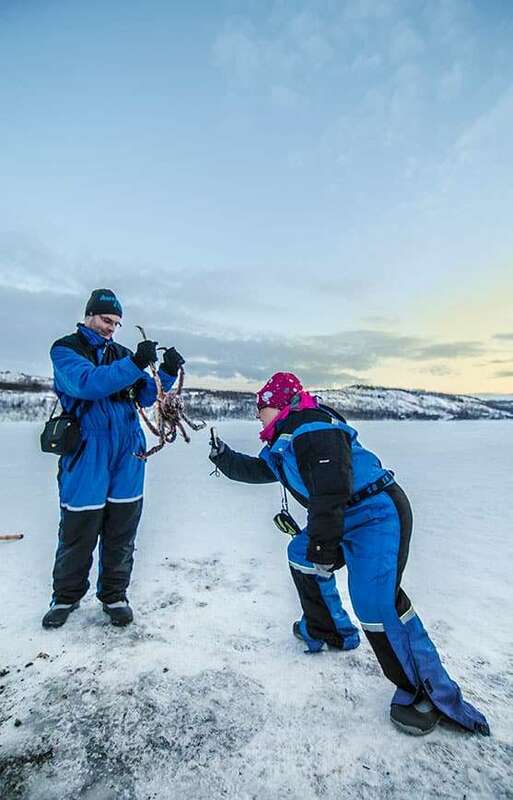 This unforgettable experience includes an overnight stay at a delightful hotel, perfectly located in the centre of Kirkenes, Norway, and king crab fishing. 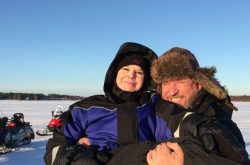 Relax and explore the town, before you’re swept away on a snowmobile to sample one of the greatest Arctic offerings. 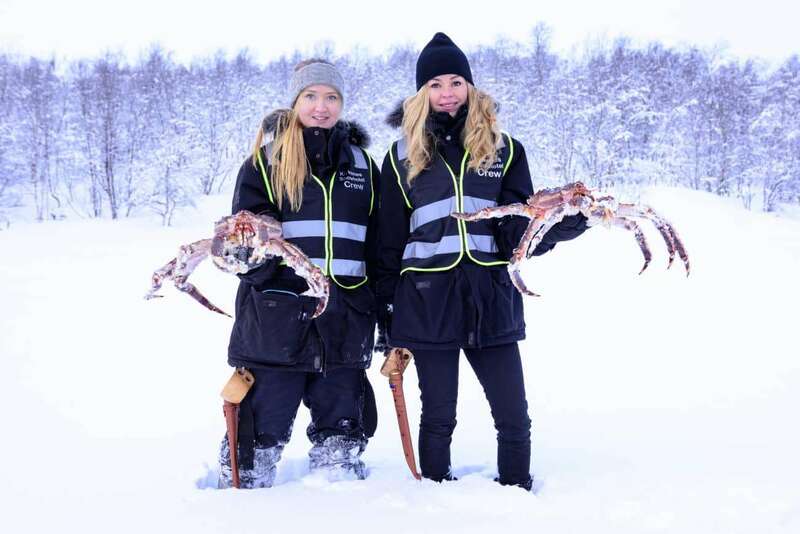 The Arctic king crab. Get involved and cut the ice, catch the crab and – most importantly – eat the delicious meat at a cosy lakeside cottage. With transfers included, this really is the best way to get a taste of the action. To make sure you get the best experience with the king crab fishing tour, your adventure begins with a bright and early 7.30am start. 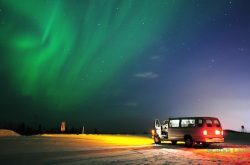 Convenient and straightforward, our shuttle bus will take you straight to Kirkenes. 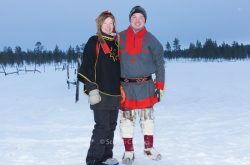 Depart from either Ivalo (included), Kakslauttanen, Saariselkä or Inari – the choice is yours. Before departure you may want to check the weather in Kirkenes. Arriving at 11am, you’ll have a few hours to spare before you check-in. Where? 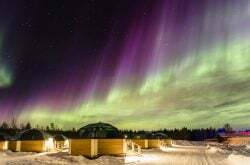 Your accommodation will be either the Scandic or Thon hotel in Kirkenes – both are four-star hotels with superb reviews. The ideal location and high-quality facilities of the two fantastic options are sure to make your stay enjoyable, comfortable and memorable. Standard check-in is at 2pm, with some availability of early check-in. Want your trip to be even more spectacular? 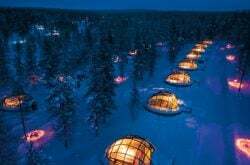 As an optional extra, you can stay in the incredible Kirkenes Snow Hotel. This unique experience is completely encapsulating. Snows suites, ice beds and amazing snow sculptures. Although the frozen delights might suggest otherwise, the thick walls of snow provide plenty of insulation to protect you from the sub-zero outdoor temperatures. It’s King Crab Safari time! 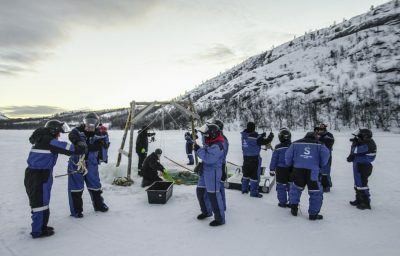 Saw the hole – everyone gets to try sawing the hole in the ice. It’s this hole through which the majestic creature will be caught. Catch the crab – you won’t believe your eyes as you get the full experience of catching a king crab. Prepare the meat – a culinary masterclass, as your master guide shows you exactly how to prepare the crab. If all that isn’t enough, you then get to enjoy the feast. 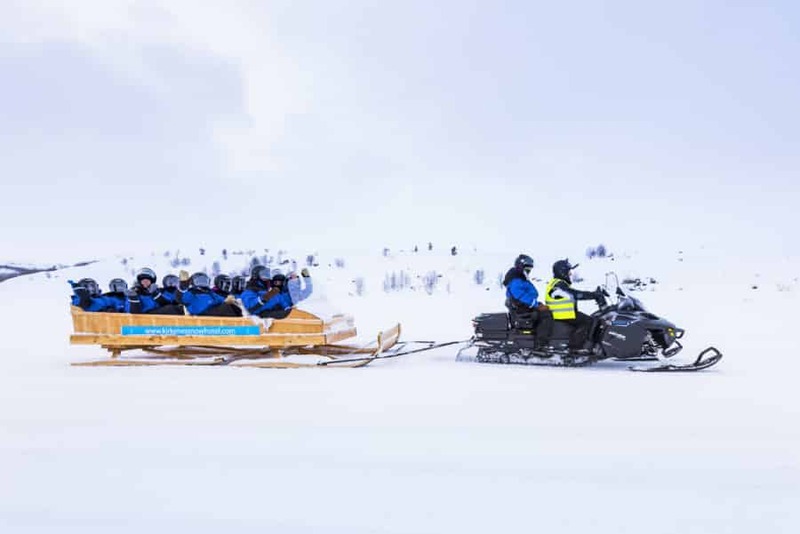 An exhilarating snowmobile sledge ride takes you back to a cosy farmhouse overlooking a gorgeous icy fjord. It’s here that you can unwind and discuss your unforgettable experience over a delectable meal of crab meat. 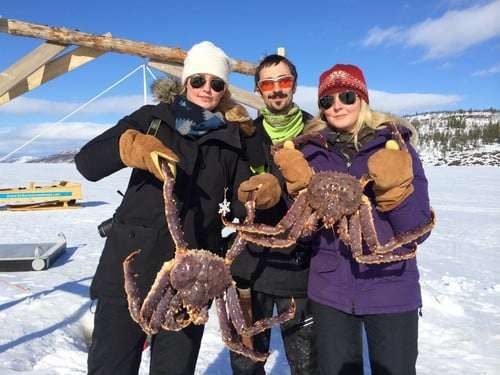 With naturally sweet, succulent white meat, you can see why the king crab is such a highly sought after delicacy and why king crab safaris are so popular. Delicious! You will return to your hotel at 9.30pm for a night of pure comfort and luxury. Returning home doesn’t have to be rushed, with an 11.45am departure from Kirkenes. 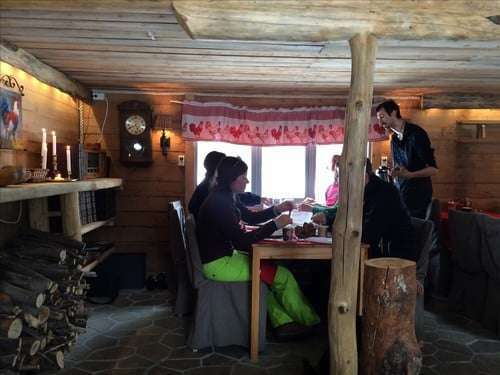 You’ll have plenty of time to enjoy the breakfast on offer and soak up some more of that fresh Arctic air, unique to the Norwegian coast. After the king crab fishing experience, arriving back in Ivalo, Kakslauttanen, Saariselkä or Inari at 5.30pm, you’ll be fulfilled, refreshed and completely in love with King Crab Safari. 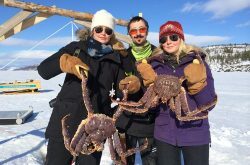 Contact us today to discuss your next King Crab Safari adventure. Scandi Travel offer superb rates with a first-rate service that’s guaranteed to provide you with a relaxing and unforgettable experience. This tour is arranged for individual travelers. There will be no other guests on the tour with your booking. – The pick up from Saariselka hotel was on time and the whole journey from Saariselka to Kirkenes was a pleasant journey with spectacular views. 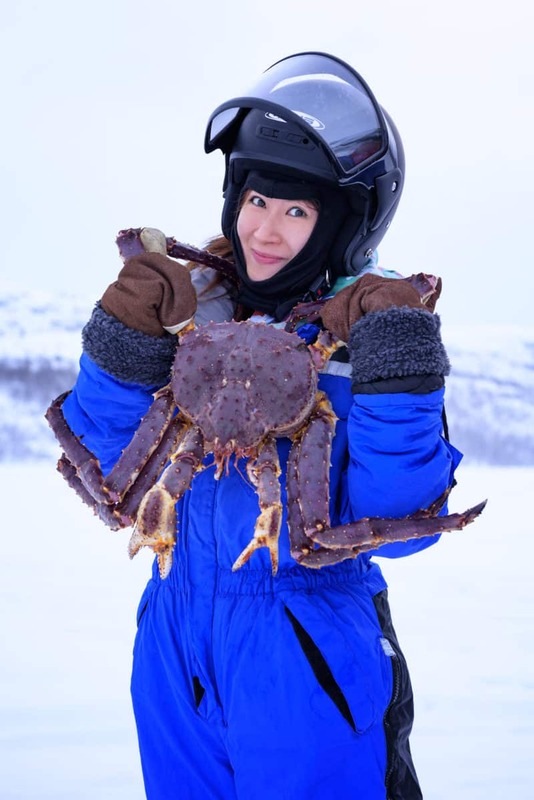 – the driver who fetched us from the hotel to King Crab Snow Hotel was very friendly. – the whole tour was great and our tour guide was very good in explaining from the catch of the crabs to the cooking of the crabs in details to us. – the customer service for this tour is very good in handling all my matters from the booking of the tour towards the end of the whole tour. – generally a great experience with this tour! Thank you Scandi for the great experience! We loved it. Children 7 - 11 y.o. Children below 7 y.o. are not admitted to this tour.